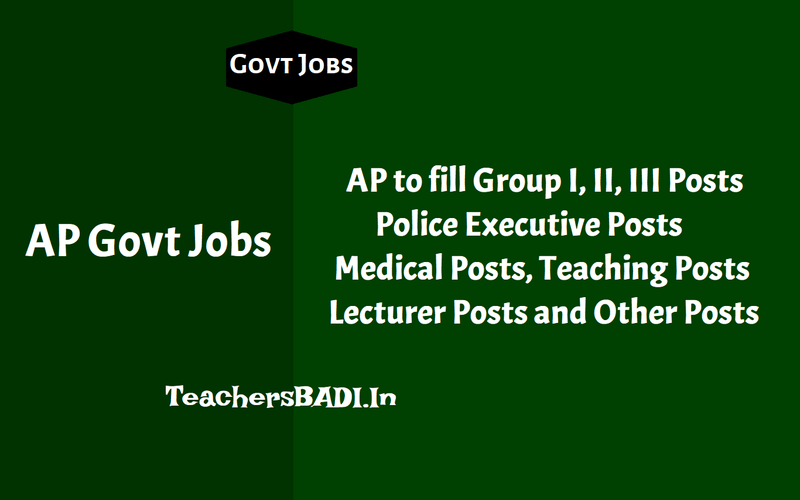 APPSC Group I Posts Recruitment, APPSC Group II Posts Recruitment, APPSC Group III Posts Recruitment, Home Department AP Police Posts Recruitment, AP Medical & Health Deprtament Posts Recruitment, APPSC Lecturers Recruitment, Other Posts Recruitment, AP DSC Teaching Posts Recruitment notifications to be out soon according to AP GO.153. AP Teaching Posts i.e AP Gurukulams Teachers Recruitment, AP Residentials Teachers Recruitment, Ashram Schools Teachers Recruitment, AP Tribal, Social, BC Welfares Teachers Recruitment notifications to be issued soon. Chief Minister of AP gave nod for filling of 20,010 vacancies in various government departments in the State. He directed the officials to speed up the appointment process and the respective notifications are likely to be issued shortly. The decision comes soon after the launch of Mukhyamantri Yuva Nestam website to pay unemployment dole of Rs 1,000 per month to jobless youth from October 2. Now the state govt is ready to take up the appointment process in various departments. The Andhra Pradesh Public Service Commission (APPSC) is all set to start the recruitment process for 18,450 posts in the states. According to a notification, the Andhra Pradesh government has decided to recruit nearly 19,000 personnel to fill up existing vacant posts in various departments and the state secretariat. The online recruitment process will begin in October and to be completed by December 2018. AP to fill APPSC, DSC, Police, Teaching, Health, Lecturers, Other Posts through Direct Recruitment 2018 (AP to fill Group, Police, Teaching, Health, Lecturer, Other Posts through Direct Recruitment 2018): The State government has decided to fill the vacancies in various departments through APPSC, DSC and Police departments. The existing vacancies include 150 group I posts, 250 group II posts, 1670 group III posts, 1604 vacancies in other departments, 310 polytechnic lecturer posts, 200 junior lecturer posts, 10 APREI society posts, 5 APREI society degree college lecturer posts and 200 degree college posts. The posts to be filed through DSC include 9,275 including vacancies in ZP, and MPP schools, 5000 municipal school vacancies, 1100 residential schools teacher posts, 750 social welfare residential schools posts, 500 scheduled area ashram schools posts, 350 BC welfare residential schools posts and 175 APREI society teacher posts. Similarly, the Chief Minister gave clearance for filling of 21 vacancies in Information and public relations department including 4 DPRO posts, 12 APRO posts, 5 DETE posts. The Chief Minister directed the officials to complete the appointment process as soon as possible. The APPSC and DSC is likely to issue notification soon. AP Government is contemplating for filling up of vacant posts existing in various departments and the Secretariat Departments through direct recruitment. Accordingly, necessary indents have been called for from all the Heads of Departments and the Secretariat Departments in the reference second read above. Direct recruitment to fill in a total 18450 (eighteen thousand four hundred and fifty) vacancies in different categories including the categories that are classified as Group-I (182- posts), Group-II (337-posts), Group-III (1670-posts), Police Executive (3000- posts), Medical (1604-posts) and Others (1657-posts) and also Teaching posts (9275-posts) and Lecturers (725-posts) in various categories through direct recruitment from the respective recruiting agencies. The Heads of Departments and the Secretariat Administrative Departments shall take necessary action to furnish the details of all vacant posts authorised in this orders including the Zone/District-wise vacancy position, roaster points and qualifications etc., to the respective recruiting agencies concerned. PUBLIC SERVICES - Recruitment - Filling up of vacant posts through Direct Recruitment – Permission to the Recruiting Agencies - Accorded-Orders - Issued. in various categories through direct recruitment from the respective recruiting agencies. The state government will fill up 182 posts in Group-I category, 337 posts in Group-II, 1,670 posts in Group-III, 3,000 posts in Police Executive, 1,604 posts in medical and 1,657 other posts, it said. That apart, about 9,275 teaching posts and 725 lecturer posts in various categories will be recruited directly from the respective recruiting agencies, it said. All the heads of departments and the secretariat administrative departments have been asked to take necessary action in this regard, the order added.